Spring Fever? I have a cure for it… Provence in May. 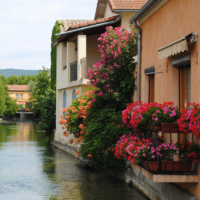 Explore Provence and for one week, live the French way…Everyday! This is a once-in-a-lifetime opportunity to explore Provence and all its wonders. Hosted by myself and colleague, Susan Schultz, we have with 10+ years of experience. The Everyday Extraordinary Provence tour is based from a wonderful mas in the heart of Provence, we’ve put together a week of unparalleled adventure, including amazing design expeditions, craft & techniques, treasure-hunting and much more; all set against centuries of history, and Provençal meals to swoon over . Combine business with pleasure and expand your design horizons. Based from a fabulous mas in the heart of Provence, we’ve put together a week of unparalleled CEU textile education, including amazing design expeditions, craft & techniques, treasure-hunting; oh and of course, food + wine! Our trips are created, as designers, for other designers; so you’ll experience Provence as a design insider with what has become all their tours’ signature- private design destinations. From private textile trunk shows, painting lessons and treasure hunting in Ile sur l’Sorgue to petanque, wine tastings, meals by our private chef and an exclusive Woad dyeing workshop at our bastide this is a remarkable week to live the French way… Everyday!